The movement of the outer planets, Pluto, Neptune and Uranus, is generational. In particular, Pluto’s movement is slow enough — it takes about 15 years to get through a sign — to give us a wide cohort. Pluto tells us what is powerful, what is transformed, what is lost. It’s interesting to look at the time when a particular Pluto generation comes of age, and then again when that generation comes to power. These are not necessarily at the same point. For example, the Baby Boomers (Pluto in Leo) came of age in the 1960s and 1970s but they came to power in the guise of Bill Clinton, Tony Blair and Angela Merkel. So this tends to happen — very broadly — at the ages of around 24 (2nd Jupiter Return) and then around 50 (4th Jupiter Return/Chiron Return). This generation was culled on the battlefields of the Somme, and the wars leading up to it and then went on to transform communications — through literature, film, radio and public address systems. Anti-colonial liberation movements across the globe were driven by the words of these people — including Kwame Nkrumah and Jawaharlal Nehru, who both finally led their respective countries after WW2 during Pluto in Leo. 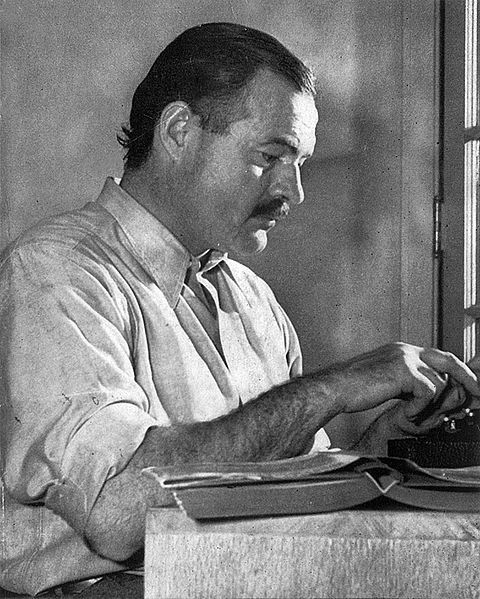 Ernest Hemingway (Pluto in Gemini) and his contemporaries were dubbed the “Lost Generation” by Gertrude Stein, because of the killing fields of WW1. 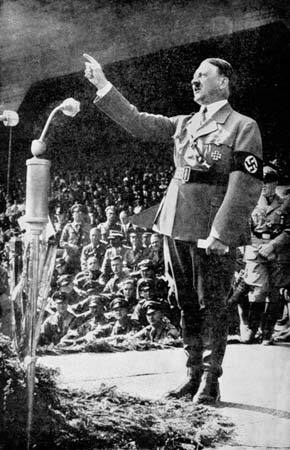 Coming of age in the interwar period, WW2, and into the 1950s. “The “Greatest Generation” grew up during the Great Depression and then fought in the Second World War. They were followed by “The Lucky Few” or “The Silent Generation”. Cancer is a sign associated with the motherland, and when these people came of age in the 1930s, so did nationalism, notably in Spain, Germany, India and Japan. WW2 was in some senses a giant tribal conflict. After WW2, the end of colonialism saw tens of new states emerge across the globe, changing the map of the world, and entrenching disputes that people are still willing to die for today — Kashmir, Israel, Sudan. This generation went on to create the post WW2 “nuclear family” — a phrase which is literally Pluto in Cancer. The Lucky Few or Silent Generation refers to those who were too young to fight in WW2 but reaped the benefits of post-war prosperity. The term teenager was coined in 1944 by Life magazine to describe them also. It’s notable that much of the social transformations of the 1960s was actually driven by this generation — including for example, Martin Luther King and Gloria Steinem. Family power or tribal transformation. 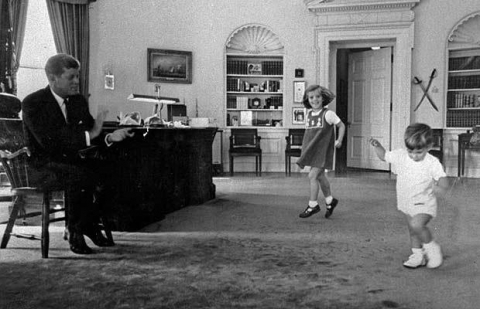 John F Kennedy watching his children dancing in the White House. Pluto in Cancer. He was the first US President whose family played such a visible role in the heart of power. Coming of age during the late 1950s, 1960s and 1970s. 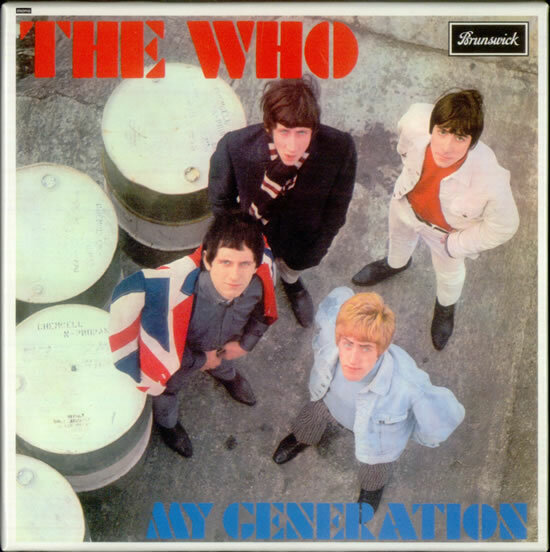 The “Me Generation”, “Baby Boomers”. Boomers came of age with a huge amount of fanfare, noise, drama, light and fireworks in the 1960s. The generation gap was a term invented for them. The swinging 60s, rock&roll, mini-skirts, Woodstock, African liberation, black power, feminism. Self-expression, self-realisation, invention, creativity, experiment. Leo is a most creative sign anyway, and Pluto was sextiling Neptune (the planet of music) in Libra (art herself) for most of the time — John Lennon, Jimi Hendrix and all the big 60s and 70s names have this placement — right up to Prince and Madonna in the 1980s. 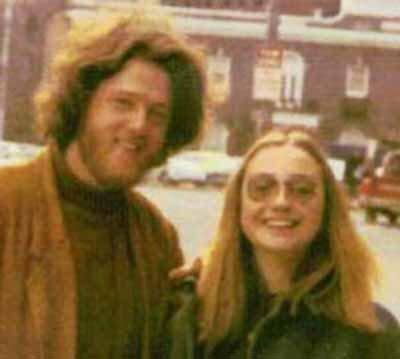 This famous picture of the young Clintons was taken in 1970. Both have Pluto in Leo. These children were born in a period of rapid population growth after the world wars, so there were many more of them than Pluto in Cancers. Indeed, the world population, which up until then had been gently increasing, took off like a rocket in the 1940s and has increased exponentially since. At the same time, they have been lucky enough to live through an age of growing prosperity — and in the West peace. Wars were fought in far off places rather than on home soil. Boomers have written so much about themselves and their generation that it hardly needs explaining — but in two phrases: creative power; personal transformation. We are now at the crossover in power between the Pluto in Leo generation and Pluto in Virgo, but with some notable exceptions, Pluto in Leo (the sign that rules by divine right) are still in the driving seat. US President Barack Obama and British Prime Minister David Cameron both have Pluto in Virgo, for example. But most of the Republican and Democratic presidential hopefuls belong to the previous generation, so the US could revert to a Pluto in Leo in the White House — as it was under Bill Clinton and George W Bush. In Europe, Pluto in Leo still holds the whip hand. Francois Hollande and Angela Merkel are both Pluto in Leo. The rebellious Greeks were, of course, Pluto in Virgo (Varoufakis) and Pluto in Libra (Tsipras). Chinese premier Xi Jinping is the older generation, as is Vladimir Putin, but his powerful Prime Minister Dmitry Medvedev has Pluto in Virgo. Virgo through Capricorn later this week. ahhh as I was reading I was looking forward to see Pluto in Scorpio. Alright though, I’ll wait until next week, great series! Pluto in Scorpio child here, 1990 and it’s in my 1st house too! It’s almost finished. The problem is condensing it! "Amon Goeth: What is power? Oskar Schindler: Power is when we have every justification to kill, and we don't." Sorry – I’ll correct that. Pluto in Virgo had the sextile from Scorpio, of course!! Pluto was sextiling Neptune in Libra for most of the time…I well know…I’m one of ’em! Canada just blew right past into Pluto in Libra with Justin Trudeau! I’m a Pluto at 2 Virgo from September 1958.
great research of yours…….. great article too. There are not so many people those write about Pluto. I find it interesting that the Pluto in Leo generation — my particular cohort — refuses to leave the stage. (Witness all the aging rockers who are still performing, even if it’s at casinos.) That’s Leo in a nutshell. I’m curious to see what you have to say about the Pluto in Libra Gen X-ers. They seem to be particularly inflicted with relationship issues. Pluto in Virgo drives me insane. They seem to be the generation who is telling all of us that that (whatever it is) isn’t good for you. A friend of mine, who studied astrology, did his masters thesis based on the work of Strauss and Howe, whose cohorts conformed loosely to the movement of Pluto around the zodiac, I’ve found that their thoughts can help to inform astrological work. I’ll be curious as to your insights regarding the Pluto in Scorpio and Pluto in Sagittarius cohorts. Thanks for pointing me towards Strauss & Howe. I’ve just read the Wiki entry but it looks extremely apposite. I actually wrote the whole thing up to Capricorn and then realised I’d bitten off more than I could chew. The further back in history a generation, the easier it is to see the Pluto focus. The closer to our own time, the fuzzier. Each generation really deserves a whole post if not a whole book! Nevertheless, I will deliver the next lot and then reassess. I can’t wait for their (my) turn in the seat of power. Hopefully we will be the generation to root out the institutional corruption and overall big business related nastiness. Which could in turn pave the way for the Pluto in Sagittarius reformers and idealists to build a brighter tomorrow. It started with rock & roll in 1950. Or you could be more corrupt than any before! Pluto in Scorpio is power crazy and fearless – some Pluto in Scorpio will also have a Mars conjunction. Think uber mafia! I can’t think of a more controlling testing configuration than this one! We wait..!!! Thomas Wright (astronomer), K.S. Desikar (philospher), Frederick the Great (King), Lydia Taft (suffragist), Jean-Jacques Rousseau (philospher), Angélique du Coudray (pioneer of modern midwifery – Hello Virgo! ), Denis Diderot (philosopher), Claude Joseph Vernet (painter), Arima Yoriyuki (mathematician), Mary Frances of the Five Wounds (was a nun, now a saint), Capability Brown (landscape architect), Horace Walpole (writer/art historian), Elizabeth Carter (writer/bluestocking), Elizabeth Montagu (salonist/critic/bluestocking), Thomas Chippendale (furniture maker), Johann Gottlob Lehmann (geologist), The Bonny Prince Charlie (pretender), Samuel Adams (revolutionary/politician), Hyder Ali (sultan of Mysore), Adam Smith (economist), Joshua Reynolds (painter), Eva Marie Veigel (ballet dancer), Immanuel Kant (philosopher), lots of scientists & missionaries, quite a few American & French revolutionaries, and quite a few women writers, poets, hymn-writers, and members of the Bluestocking Society. Could our Pluto in Virgo generation along with our Pluto in Libra folks be the instigators a new Enlightenment or science revolution? The science revolution has been slowly creeping along and is in full force thanks to the scientists of the Electric Universe collective. Revolutionary scientist Rupert Sheldrake is a Pluto in Leo as are most of the Electric Universe scientists leading the movement. Pluto in Leo was very revolutionary not only in the arts. Science can be very creative too. Pluto/Uranus in Virgo bridges the gap between art and science – look at computers! Steve Jobs was a Pluto in Leo (huge vision) who transformed Pixar from a graphics company to making 3D animations and now the leading computer generated animations production company. Jobs would have Uranus and Pluto transit his Virgo asc and oppose his pIsces Sun. So he’s a visionary (art) confronted/driven by technology (science) and marries the two to incredible effect. What Jobs did to take computers out of the box is massive! Christina, you should also involve Uranus in the evolution. Uranus makes us aware that something has to change, then along comes Neptune who dissolves society as it was and we need Pluto to actually change us and who builds a new society (I guess together with Saturn and Jupiter). The generation of astronauts and cosmonauts that went first into space and to the Moon was the Pluto in Cancer one. Neil Armstrong has the Pluto in Cancer, Moon in Sag (talk about long trips!) in mutual reception with Jupiter in Cancer. NN in Aries…of course! My question, dear Christina: Do you think Pluto is perhaps even exalted in gemini? Or could you also write something about your theory of exaltation of Pluto and Neptune? Gemini is the sign of duality in esoteric astrology. I would say it is more in its fall than exaltation in Gemini, more representing of the fall into duality/separation from the source and having to grapple with the mind and its constructs which encourage separative thinking. Perhaps as Christina has said – we should look at the empty arm of the Saturn/Jupiter/Neptune set up now, i.e Gemini! The twins are not identical! One plays the lyre and one has a club. While one will spin you a yarn, the other is ready to club you while you are entranced! If Sagittarius is the sign of “man” – trying to grow out of his animal self (half man half beast) it is in Gemini where the work needs to be done but both lyre and club need to be put down. The we get one mind. Such interesting responses to the Pluto in Gemini — maybe we have the distance now to understand it better. I think Eleonora’s question deserves more of an airing. Once I’ve finished writing this month’s horoscopes I think I’ll put up a post about it and see what people say to the question of exaltation of the outer planets.